Southbank Centre’s Africa Utopia is back for a third time and explores what can be learnt and celebrated from modern Africa and the African diaspora. The festival investigates the arts and culture of one of the world's most dynamic and fast-changing continents and looks at how Africa can lead the way in thinking about society, community, business and technology, fashion, gender, power, politics, sustainability and activism. This year’s festival features some of the greatest artists from the African diaspora across music, dance, literature, and the visual arts, alongside a three-day programme of talks, debates and workshops. Southbank Centre’s spaces will be transformed by a myriad of free art installations, a buzzing indoor marketplace, family events, a celebration of African-inspired fashion, Afrikan yoga, dance, singing, craft and story-telling workshops. Also, for the first time at Africa Utopia, Pop Up Africa presents The African Street Food Takeover, over 20 stalls serving authentic African cuisine from across the continent. A buzzing indoor marketplace offering the latest in African inspired fashion, accessories, books, art and home-ware; and Pop Up Africa presents The African Street Food Takeover, over twenty stalls serving authentic African cuisine from across the continent (Fri 11–Sun 13 Sep). Artist Phoebe Boswell combines traditional draughtsmanship with digital technology to create drawings, animations and installations that explore global, fragmented narratives such as her own. Born in Kenya to a Kikuyu mother and fourth generation British Kenyan father, Pheobe was brought up as an expatriate in the Middle East before coming to London, where she now lives and works, and explains "I have always had a delicate understanding of the meaning of 'home'." As such her history, identity and work is rooted in themes of migration and a personal exploration of home. There are twelve figures featured in Transit Terminal. FNA-CKY-CDG-LHR – the title for the child figure, describes the child’s journey from Freetown, Conakry, Charles de Gaulle to London Heathrow airport. London-based artist Lakwena Maciver makes large-scale, kaleidoscopic street art and paintings. Lakwena takes her inspiration from designs and communication used in popular culture, street art and advertising that coexist in the urban environment. Using bright colours and bold geometric patterns she remixes these influences to create highly decorative paintings often with a powerful message that shift values around gender, worship and myths. 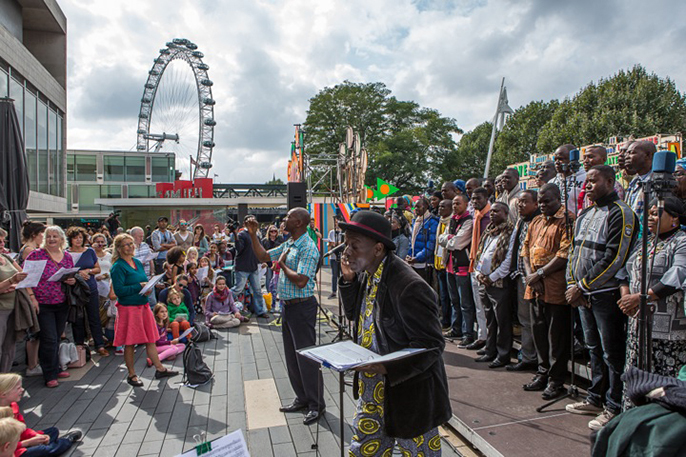 Join us in the Africa Live Lounge for incredible free live music throughout Africa Utopia. Each day of the festival, the Africa Live Lounge offers a relaxed performance platform for new emerging artists and community groups, featuring real up and coming talent, showcasing the innovative musical forms and styles taking inspiration and influence from Africa. Full schedule of performances will follow. Join us to learn traditional African dance styles at African Utopia Festival. Enjoy the rhythms of African music whilst dancing alongside others and making new friends. Everyone is welcome, beginners and experienced dancers alike. As part of Southbank Centre’s series of regular social dances. In COAT, Yomi Sode tackles migration and identity using the audience as his counsellor. An attack at his workplace uncovers various flash points in Yomi's upbringing that are confusing, at times humorous, and uncomfortable. Developed as part of Re:Play. Spoek Mathambo is one of South Africa's most forward-thinking and renowned artists. His lengthy resume includes work as a musician, MC and documentary maker; his film Future Sounds of Mzansi delves into the various strands of South African electronic music. Join him for an evening of performance that reveals his restless creativity. During Africa Utopia, Acts of Looking digital project space will be transformed into an online space that explores contemporary African culture and creativity. Working in partnership with Jepchumba, Kenyan digital artist and founder of African Digital Art, Southbank Centre will invite a range of female creatives and image makers to contribute to the online space. We will then curate a series of Africa Utopia projections on the Royal Festival Hall during the Festival weekend. Acts of Looking is a digital project space that aims to curate online imagery that asks people to look again and think about the visual culture that surrounds them. Our focus is to celebrate digital creative culture and present a diverse range of imagery, ideas and cultures by collaborating with a range of established and emerging creatives. Explore African politics, technology, education and trade with a day of talks and debates. Panel discussions, keynotes and workshops examine everything from disruptive innovation to the power and politics of data in Africa. The day includes talks on the joys and challenges of doing business in Africa, the future of digital journalism and what really happens when diaspora Africans return home to set up a business. Speakers include Baaba Maal (co-founder of the first Africa Utopia), Victoria Moores (African Aerospace), Feruz Werede (Network for Eritrean Women), Vanessa Iwowo and Awol Allo (LSE), Afua Hirsch (Sky), and Mariéme Jamme (technologist and founder of Africa Gathering) who also leads a Hackathon for Gender Equality. Celebrating all things African, this buzzing market hosts stalls featuring art, homeware, fashion and accessories, in the style of an African trading market. Keep an eye on the website for updates and details of market stallholders, soon to be announced. Pop Up Africa presents The African Street Food Takeover, over twenty stalls serving authentic African cuisine from across the continent featuring Zoe's Ghana Kitchen, Baba Ganoush, Ethiopique, Shocka's Coconut Hub, Chale Let's Eat, Massi Ma,Ethiopian Coffee Company, Big Mamma's Kitchen, Sal's Shack, Kato Enterprises, Mama's Jerk Station, Mr Spicy, Chishuru, Moyo London, Makalini's, Ije Shop, RedGreenandBlack, Gidi Sharwama and more. Maia Von Lekow's music combines afro-jazz, folk and soul with Swahili spice. The Kenyan musician has supported artists including James Blunt, Habib Koité, Thandiswa and Mafikizolo, and performed at festivals across Africa. Maia's debut album ‘Drift’ was released in 2013. 'Uko Wapi', from her self-titled EP, received two African Academy Awards for best soundtrack. Electric Jalaba brings together members of Soundspecies and Moroccan musician Simo Lagnawi, a singer, dancer and the leading UK player of the Guembri – a traditional lute-like stringed instrument made from camel skin. Their collaboration combines Simo's mesmerising Gnawa music with Soundspecies' multifaceted musical background, influenced by jazz, techno, funk, psychedelic rock and desert blues. Senegal's mighty Orchestra Baobab perform their first London show in three years. One of the best known groups in Africa, Orchestra Baobab formed in 1970, taking their name from the Dakar night-club where they were resident. They drew musicians from all over Senegal as well as Togo and Nigeria, playing multi-lingual, multi-ethnic music with a strong Cuban flavour. Orchestra Baobab released dozens of recordings until they split in 1987, before reforming in 2001 with the encouragement of Senegalese superstar Youssou N'Dour. Since then, they have toured worldwide, released their first new recordings in nearly thirty years and received two BBC Radio 3 awards and a Grammy nomination. Support comes from singer-songwriter Blick Bassy, who performs in Bassa, one of 260 languages spoken in Cameroon. His latest album, ‘Akö’, is influenced by bluesman Skip James and the itinerant musicians he encountered during his rural childhood. London-based promoters Wormfood showcase a new generation of home-grown artists who have been inspired by African sounds. Headliners Afriquoi combine the virtuosic kora of Jally Kebba Suso and the guitar of Fiston Lusambo with percussion, vocals and live electronics, marrying traditional African music with an uplifting, contemporary UK style. KOG and the Zongo Brigade – Glastonbuy Emerging Talent runners-up 2015 – deliver infectious West African vibes from Ghana via Sheffield, blending afrobeat, soul, funk and reggae. Pioneering dub-reggae ensemble African Head Charge – led by co-founder and percussionist Bonjo Iyabhinghi Noah – fuse primal drumbeats with psychedelic dub, roots reggae and modern electronica. The night ends with DJs who take African music in new directions. Nubiyan Twist play some of the tracks that have influenced them as a band, including afro-funk, afro-Brazilian and afrobeat favourites. This UK premiere is a sideways look at the migrant’s story of survival by acclaimed Belgium-based director Ahil Ratnamohan. Star Boy Productions invites audiences to learn the clandestine tricks required by African migrants to remain legal in the EU and examines the psyche of those attempting to create a better future for themselves. Presented by three African migrants (West African footballers based in Antwerp making contemporary performance about Europe, visas, and azonto), this searingly truthful play invites an audience into their world of survival, explaining the lengths one can and must go to in order to remain in Europe – the illegal things people do in order to become ‘legal’. Created by Etuwe Bright Junior, Lateef Babatunde, Aloys Kwaakum, Ahilan Ratnamohan and Kristof Persyn. Lighting by Wouter Dupon. Co-produced by Monty and CC Luchtbal. Supported by the Flemish Government, City of Antwerp and the Australia Council for the Arts. Saturday's talks look at the how the arts across the continent are affecting social change. Who is shaping African design? What varies between different regions? How are the arts challenging stereotypes and existing narratives about the continent? Hear from leading African and diaspora designers, writers, performers and creators. Speakers include Nimco Ali (anti-FGM campaigner), Sunny Dolat (The Nest Collective), Zimbabwean author Tendai Huchu, Afrofuturist author Tosin Coker, Ade Adenji (co-founder of The Quest), actor, director and feminist activist Abraham Popoola, writer, musician and activist Chardine Taylor-Stone, Irish Nigerian visual sociologist and writer Emma Dabiri, plus poet and women’s rights activist Jessica Horn presenting The Love Mic with performance and dialogue from poets Amaal Said, Toni Stuart and Rich Blk and musician Matshidiso. The Nest Collective presents the first readings outside Kenya of the true stories of the country’s LGBTQI community, The Stories of Our Lives, alongside a screening of the eponymous prize-winning film, banned in Kenya. This form of yoga is known for its use of rhythmic movements, helping to warm up the body in order to perform postures. The practice focuses on elemental body awareness and breath. The development of flexibility, mobility strength, and endurance are emphasised, uniting the body, mind and spirit for health and well-being. The morning session will be led by experienced teachers Lenea Herew and Pablo Imani. An interactive storytelling and dance performance with Funmi Adewole telling the adventure story of a boy who loves to drum and dance as he is sent to a forest to pick fruit for his Aunty. Along the way he meets a strange animal who has the head of a lion and the legs of an elephant. Participants will listen, dance and feel the rhythms of the forest. Join Tiata Fahodzi Theatre for a style consultation and help them shape their new play. Meditating on beauty, blackness, femininity, society and community, the actors invite participants to take a seat in the salon chair and indulge in conversation between hairdresser and client, as part of their research and development for a play set in a black hair salon. An afternoon of contemporary African fashion and style, created by dozens of designers and stallholders descending on the Southbank Centre for Africa Utopia, including Market Stories, a series of moments on The Clore Ballroom where traders are invited to explain their crafts, their ideas, themes and how they source materials. The afternoon culminates with special show curated by Samson Soboye featuring five exciting African fashion designers. 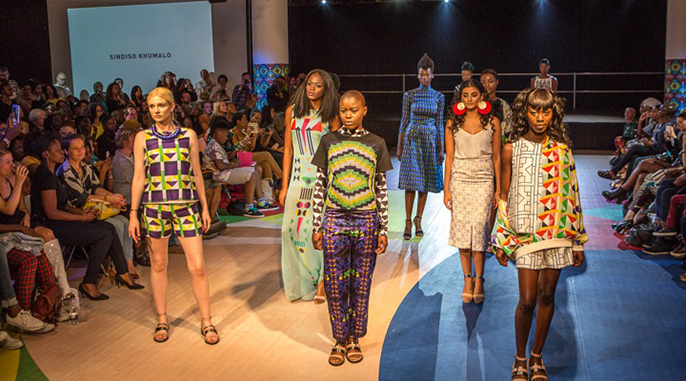 Join us for the People's Catwalk, showcasing African influences on London fashion. Members of the public are invited to send images of how they wear their heritage and what it means to them; with the best entries picked to walk the catwalk as part of the show. Designer and stylist Samson Soboye has enticed shoppers in Shoreditch for over ten years with his eye for the new and fabulous. He brings together a team of leading designers from the African diaspora to present inspiring women's wear, menswear and accessories, in an interactive fashion showcase. Southbank Centre’s Voicelab is back with popular singing workshops for all abilities – no experience necessary. Singer Namvula Rennie leads an open and inclusive creative vocal workshop using South African and Zambian traditional song. This workshop for singers of all abilities is taught entirely by ear. An informal pop-up performance concludes the workshop, to showcase the reworked songs. Kassé Mady is one of Mali's greatest singers, a griot of the Diabaté family. For this concert, he is accompanied by three musicians who represent different areas of Manding-speaking West Africa. Ballaké Sissoko plays kora, from the Casamance region, Lansiné Kouyaté performs on balafon, from the central zone, and Makan Tounkara plays the bitter-sounding ngoni of the northern deserts of Mali. The different instruments are drawn together by Kassé Mady's soft baritone voice, singing in Bambara. Kassé Mady's latest album is ‘Kiriké’, which means 'horse's saddle' – an important symbol of griot culture. It was produced by French cellist Vincent Segal. A night of dancing, free dance workshops and DJs. HomeBros, a diverse dance duo specialising in various styles such as Afrobeats, AfroHouse, Hip Hop, Krump, Breakin' and more will kick the evening off with a workshop to teach you their hottest dance moves. Then spend the rest of the night showing off your new moves on the dancefloor. No experience required. How do arts, culture and activism affect contemporary Africa? Start your day with the Africa Utopia newspaper review for a snapshot of the biggest Africa-related headlines and stories. This is followed by talks and debates with leading activists, makers and artists. They are showcasing their work and highlighting how art and ideas from Africa are changing the world. Speakers include journalist and curator Hannah Pool, Sunny Dolat (The Nest Collective), Zimbabwean author Bryony Rheam, award-winning literary novelist turned crime-writer Jamal Majoub, girls’ rights campaigner June Eric-Udorie, Southbank Centre Youth Amabassador and film-maker Mojereoma Egunjobi, and visual artist Larry Achiampong. This form of yoga is known for its use of rhythmic movements, helping to warm up the body in order to perform postures. The session will be led by experienced teachers Lenea Herew and Pablo Imani. Drop in to an eclectic range of dance workshops focusing on different styles from across the African Diaspora presented in collaboration with ADAD’s Bloom Festival. Suitable for dancers with some previous dance experience but who are keen to learn a new style. Workshop times vary; check website for details. Presented in collaboration with ADAD’s Bloom Festival Afro Dance Xplosion gives you the chance to try something new, learn dance from across the African Diaspora, experience African rhythms and have fun. No previous dance experience required. Ever wondered what it feels like to be inside an orchestra? This performance is the perfect opportunity to feel the incomparable buzz of being amid the exotic machinery of a real life working orchestra as you take your 'passenger seat' right in the middle of the action! Africa Utopia hosts the historic launch of Chineke!, the UK's first professional classical orchestra made up of black musicians. Chineke! means 'spirit of creation' in Igbo, and the orchestra is the brainchild of the leading double bassist Chi-chi Nwanoku who aims both to celebrate the creative energy of musicians of colour and to inspire new generations. Chineke! Youth Orchestra brings together the most talented young musicians of African heritage from around the UK in this special Passenger Seats performance, inviting the audience to get up close to the performers and experience the thrill of being in the heart of an orchestra themselves. There are limited places to be in one of the passenger seats but audience members are also up close and involved. Seats are offered on a first come first served basis. Join Tiata Fahodzi Theatre for a style consultation and help them shape their new play. Meditating on beauty, blackness, femininity, society and community, the actors invite participants to take a seat in the salon chair and indulge in conversation between hairdresser and client, as part of their research and development for a play set in a black hair salon. When King Gogo met the Chameleon has been inspired by traditional African tales and created by Bawren Tavaziva in collaboration with his dancers and dramaturge and writer Chris Fogg. Each performance is following by a half hour drumming and dance workshop for all ages. For 4-7 years. 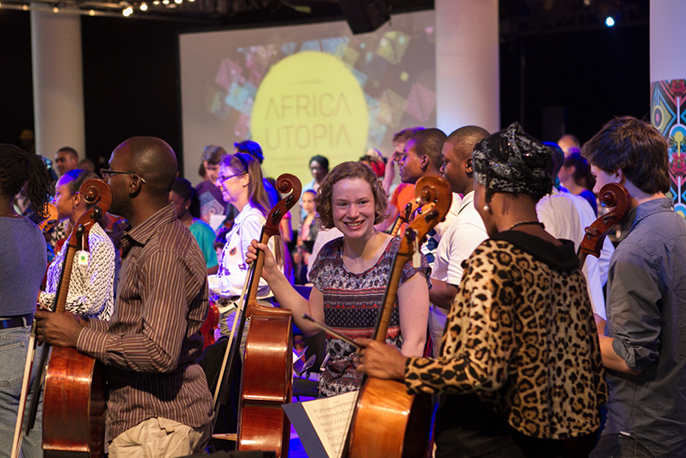 Africa Utopia hosts the historic launch of Chineke!, the UK's first professional classical orchestra made up of black and minority ethnic musicians. Chineke! is the brainchild of the leading double bassist Chi-chi Nwanoku who aims both to celebrate the creative energy of musicians of colour and to inspire new generations. As part of this radical new project, Chi-chi Nwanoku has brought together the most talented young musicians of African heritage from around the UK presented here in this special event. Chineke! Junior Orchestra perform two movements from Schubert’s Symphony No 5 alongside an informal discussion with Chi-chi Nwanoku, and conductor Wayne Marshall, about the foundation of the new orchestra. As part of the Chineke! Foundation’s launch celebrations, Africa Utopia is pleased to present this free, pre-concert public event, featuring a Q&A session with Chineke! musicians, and including performances by emerging musical talent of tomorrow: the young players of the Chineke! Junior Orchestra. Africa Utopia hosts the historic launch of Chineke! Chineke! – which means ‘spirit of creation’ in Igbo – is the UK's first professional classical orchestra made up entirely of BME musicians. The orchestra is the brainchild of leading double bassist Chi-chi Nwanoku, who aims to both celebrate the creative energy of musicians of colour and inspire new generations of instrumentalists. The concert is conducted by Wayne Marshall, and includes Elegy-in memoriam Stephen Lawrence by black British composer Philip Herbert, as well as Beethoven's dramatic Symphony No.7. Often out of necessity, and sometimes because of a desire for a different life, migration has been a constant feature of human existence since literature began. But how does the fantasy of migration compare with reality? And do we inevitably circle back to where we came from? With images of boats crammed with migrants scarcely out of the media, a panel of writers with African roots explore migrations both real and imagined. Maaza Mengiste is an Ethiopian-American author ('Beneath the Lion’s Gaze', named one of the Ten Best Books on Africa by the Guardian), Jamal Mahjoub is a Caine Prize shortlisted British-Sudanese author ('The Drift Latitudes') and Irenosen Okojie is a Nigerian-British debut author of 'Butterfly Fish', which spans modern day London and ancient Benin. Afrobeat legend Tony Allen celebrates 75 years with a performance featuring some special guests. He is joined by Toumani Diabaté, Sidiki Diabaté, and Oxmo with further special guests to be announced. Cited as the powerhouse behind the late Fela Kuti's afrobeat and highlife movement, Tony has been described by Brian Eno as ‘perhaps the greatest drummer who has ever lived’. He has spent the years following Fela deconstructing the sounds of dub, electronica, R&B and rap with afrobeat to create a hybrid genre he calls afrofunk. His latest album, ‘Film of Life’, features collaborations with Damon Albarn and cutting-edge producers The Jazzbastards and is an overview of his rich career, which brings together bebop, afrobeat, jazz and psychedelic pop. Tonight features a new collaboration between Tony and the master kora player Toumani Diabaté together with his son Sidiki Diabaté. French star rapper Oxmo contributes. This is the first UK solo exhibition of work by South African artist Dineo Seshee Bopape. Combining dense sculptural installation with video montages, her artwork engages viewers with powerful socio-political notions of memory, narration and representation. Flipping between an analogue and digital aesthetic, Bopape’s video works mix and re-mix sound and image into kaleidoscopic montages. Distinct locations and characters start to emerge, including the artist herself, only to give way to a cacophony of sampled music and sound and effects. Bopape’s videos are often incorporated into her sculptural installations. In these assemblages everyday materials – including timber, bricks, mirrors, and plants – form complex and precarious configurations, often across the walls and floor of the gallery. This exhibition presents a selection of Bopape’s video works alongside a new sculpture conceived specially for the Hayward Gallery. Born in 1981 in Polokwane, Dineo Seshee Bopape studied at the Durban University of Technology, South Africa and earned her MFA from Columbia University, New York in 2010. Her work has been show in a number of prominent international exhibitions, including presentations at the New Museum, New York; ICA, Philadelphia; Mart House Gallery, Amsterdam, and the 12th Biennale de Lyon. Bopape lives and works in Johannesburg.